Next in our story of the major arcana, and noting differences between the original Rider-Waite (RW) tarot versus the Angel Tarot is 2-The High Priestess. The symbolism includes a woman of mystery. She is located between two pillars. In the Rider-Waite (RW) tarot the pillars are dark (Boaz) and light (Jachin). Boaz and Jachin refer to the pillars which stood on the porch of Solomon’s Temple. In Angel tarot, the pillars are difficult to see but it is clear that one is lighter than the other. This is a common theme with the High Priestess. She seems to beckon us to take time to consider everything in between the dichotomous variables of light and dark, good and bad, male and female, or conscious and unconscious. In between these dualities, there is a multitude of differences and we can learn more through quiet meditation. Even her number-2-is an indication of duality. In both decks, the High Priestess is holding a sacred book. In the RW tarot, it looks like a scroll and may be locked. In Angel tarot we can see the open book showing us all of the possibilities that are out there waiting for us. In both decks the full moon is above the High Priestess. In RW tarot it is seen sitting within the horned diadem on her head; and in Angel tarot it is a colorful globe above her head. The light of the moon in Angel tarot shines bright as a full moon would and reflects the light that is within us. The moon and the High Priestess are tied to feminine nature. Also above her head in the Angel tarot is a light blue halo, indicating emotion. 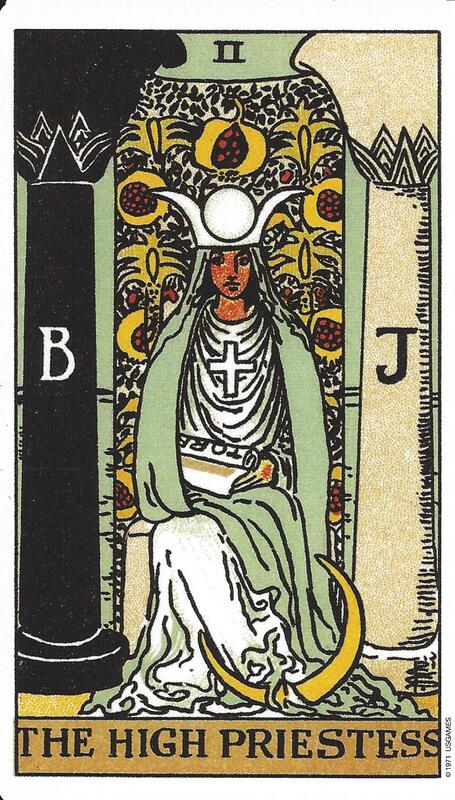 Both cards show the High Priestess wearing a cross, but it is a cross of equal proportions, a solar cross showing the significance of balance. 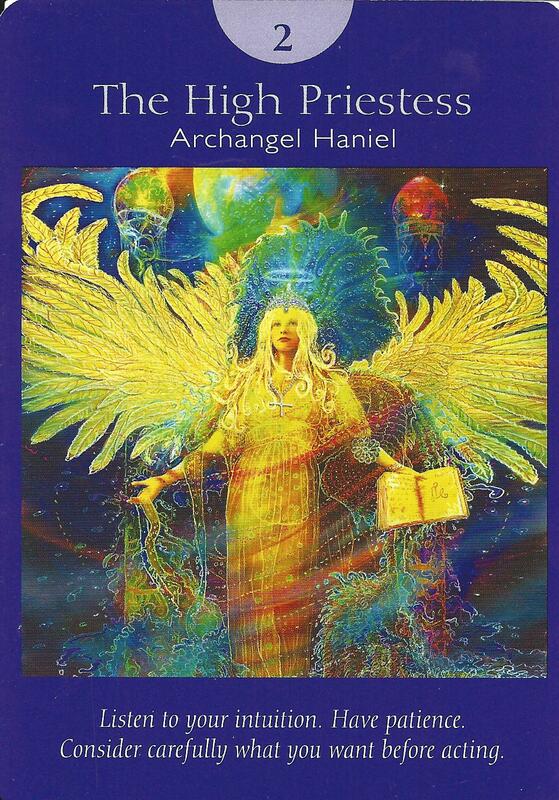 The High Priestess is associated with Archangel Haniel who is known for her intuition and clairvoyance. Her name means “the grace of God.” She will be a good guide to pay attention to as we journey. If you draw this card it is an indication that even though you are ready for the journey, you may still need to do some study or reflection. Pay attention to your intuition and trust that you will be guided. Get quiet and listen. Now is not the time to jump in and rush to begin. You must be patient and know that you will be guided when the time is right.